Communism is rarely painted in glamorous lights, but there is a place where you get to enjoy vibrant colors instead of different shades of grey. Havana is the pride of Cuba and a place that tourists from many capitalist countries dream of visiting, so it comes as no surprise that there are so many Havana printings up for sale online. A trip to Havana is special for several reasons and the simple fact that you can step into a slightly different universe is irresistible. 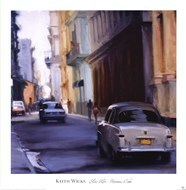 The friendly people, warm climate and interesting city architecture are all celebrated in Havana Wall Art. Cuba is also a land of dance and tranquility, with its capital city upholding the same high standards and inviting people to give in to reverie and forget about daily nuisances. Spending a few days in Havana is a great experience, but the only way of prolonging this feeling is by hanging Havana posters on the wall. They will stand the test of time and are improbable to lose their charm.